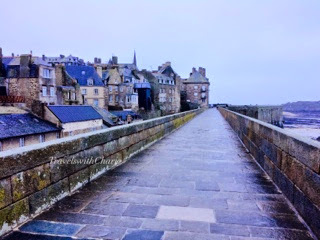 The stone ramparts of Saint Malo stretches 1,754 meters and wrap around the old town known as the intra-muros. A stroll along these ramparts is a walk through the history of this city which traces its origin to the arrival of Maclow, a monk from Wales, in the 6th century. Saint Malo is named after him. There are exits to the beach below from the ramparts. It's possible to walk to the islands of Fort National, Le Petit Bé and Le Grand Bé when it's low tide. But high tide has a way of rushing in and leaving unsuspecting visitors stranded on the islands. It's best to check with the tourist office for the times when it's safe to walk to the islands. The waters of La Manche may rise as high as thirteen meters and pound the walls of Saint Malo. The oak tree trunks lining the seashore and which form the breakwater can attest to the might of the waves.